The 15th edition of The Edge Malaysia Property Excellence Awards (TEPEA) has been an exciting event with stiff competition for rankings among listed and unlisted developers for the anchor award, The Edge Malaysia Top Property Developers Awards (TPDA). The gala dinner, attended by about 400 real estate company officials and experts, was held last Monday at Grand Hyatt Kuala Lumpur. The guest of honour was former minister of housing and local government Tan Sri Ong Ka Ting. Ong was also honoured at the event under a new category — The Edge Malaysia Outstanding Contribution to the Housing Industry — for his contribution to the industry during his tenure as minister of housing and local government from 1999 to 2008. For TPDA, S P Setia Bhd clinched the top spot. It was the second consecutive year the company won. It dropped to third and fourth position in 2014 and 2015 respectively, before winning the title again last year. S P Setia president and CEO Datuk Khor Chap Jen said the company is extremely proud to have retained the No 1 spot, which it has now clinched for the 10th time. He noted that teamwork is the hallmark of the company’s success, with Team Setia displaying a culture of passion that is grounded in being customer-focused, collaborative and innovative. “Our commitment to sustainability and innovation has not wavered and we have weathered the current market challenges with the right strategies while maintaining high quality in our product delivery,” he said. S P Setia also received the Best in Quantitative Attributes sub-award, sharing it with IOI Properties Bhd. The Best in Qualitative Attributes sub-award went to Sunway Bhd. The others in the Top 10 are Sunway Bhd (No 2), Sime Darby Property Bhd (No 3), IJM Land Bhd (No 4), Eco World Development Group Bhd (No 5), UOA Development Bhd (No 6), Mah Sing Group Bhd (No 7), IGB Corp Bhd and IOI Properties Bhd (No 8 - joint ranking), UEM Sunrise Bhd (No 9) and Tropicana Corp Bhd (No 10). IOI Properties and Tropicana Corp returned to the list after their absence last year. IOI Properties and IGB Corp shared the eighth ranking. “For the Top Developers Awards, we have both qualitative and quantitative evaluation,” The Edge Media Group publisher and group CEO Ho Kay Tat said in his speech. Judges who abstained from the qualitative evaluation were Tan Sri Eddy Chen for MKH Bhd, Datuk Michael Yam for Sunway and Paramount Corp Bhd, Datuk Jeffrey Ng for Sunway, Datuk Soam Heng Choon for IJM Land and Datuk Seri F D Iskandar for Glomac Bhd. The scores and rankings were audited by Deloitte Malaysia. 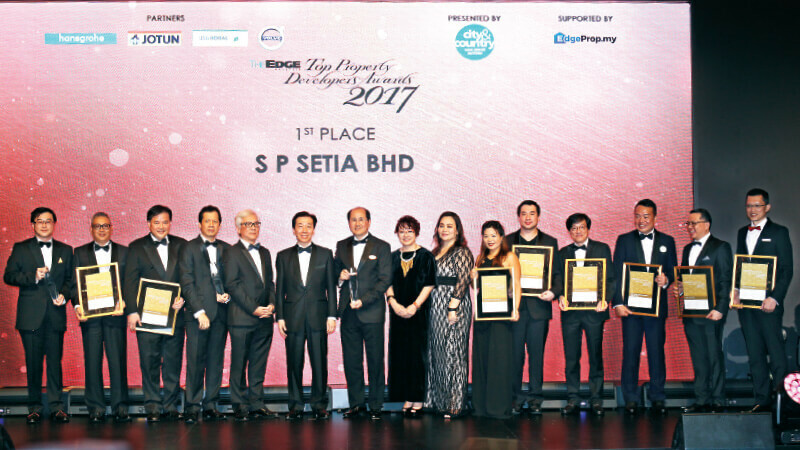 Malaysia-PEPS Value Creation Excellence Award, The Edge Malaysia-PAM Green Excellence Award, The Edge Malaysia Affordable Urban Housing Excellence Award, The Edge Malaysia Outstanding Property CEO Award and The Edge Malaysia Property Development Excellence Award. The Edge Malaysia Outstanding Property CEO Award went to S P Setia’s Khor and Sunway Bhd (property division, Malaysia & Singapore) managing director Sarena Cheah. The award recognises CEOs and professionals whose leadership has taken their companies to extraordinary heights. The Edge Malaysia Outstanding Property Entrepreneur Award was given to Matrix Concepts Holdings Bhd founder and group managing director Datuk Lee Tian Hock and Sunsuria Bhd founder and executive chairman Tan Sri Ter Leong Yap. The award recognises their achievements and contribution to the property development industry. The Edge Malaysia Property Development Excellence Award went to Mid Valley Megamall (IGB REIT Management Sdn Bhd), 1 Utama Shopping Centre (Bandar Utama City Centre Sdn Bhd) and Sunway Pyramid (Sunway REIT Management Sdn Bhd) for Excellence in Suburban Family Mall. The same award was also presented to Pavilion Kuala Lumpur (Kuala Lumpur Pavilion Sdn Bhd) for Excellence in International Luxury Shopping Mall and Regeneration of George Town (Think City Sdn Bhd) for Excellence in Urban Regeneration. The Edge Malaysia Pioneer Development Award — to recognise significant projects that have not only emerged as a pioneer in the market but also contributed positively to the growth of their surrounding areas — went to Paramount Corp Bhd (KDU University College) and Sunway Bhd (Sunway University) for diversifying to the education sector. The Edge Malaysia-PEPS Value Creation Excellence Award — started by The Edge Malaysia in partnership with the Association of Valuers, Property Managers, Estate Agents and Property Consultants in the Private Sector — recognises developments that have provided outstanding rewards to their purchasers in terms of capital appreciation. This year’s winner was Horizon Hills Development Sdn Bhd’s Phase 2C in Horizon Hills, Johor. The merit award went to Paramount Property Development Sdn Bhd’s KU Suites in Kemuning Utama, Selangor. The Edge Malaysia-PAM Green Excellence Award was jointly created with the Malaysian Institute of Architects to recognise projects that demonstrate sustainable design innovation while contributing positively to the community. The winner was Heriot-Watt University Putrajaya (Putrajaya Holdings Bhd), with Majlis Bandaraya Pulau Pinang getting an honorary mention for the revitalisation of Chowrasta Market. The Edge Malaysia Affordable Urban Housing Excellence Award, which honours affordable housing projects for the urban middle-income group undertaken wholly by Malaysian private developers, was presented to Seri Mutiara (Bandar Setia Alam Sdn Bhd). Bayu Nusantara (Nusajaya Heights Sdn Bhd) received the merit award. The Edge Malaysia Property Excellence Awards was sponsored by Hansgrohe, Jotun Paints Malaysia, USG Boral and Volvo Car Malaysia and presented by City & Country, the property pullout of The Edge Malaysia. It was supported by EdgeProp.my.